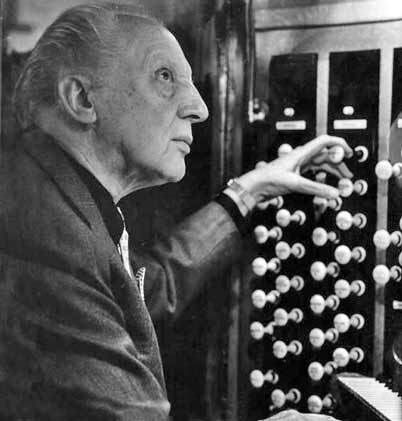 Leopold Stokowski participated in numerous interviews, often as part of radio programs, and also occasionally in the form of speeches, of which a variety of recordings survive. In some ways, these interviews have characteristics in common with Stokowski's many recordings of great music. He seems consistently to have sought to create a particular effect or impression on the listener by what he communicated. In this, the speeches and interviews seem characteristic of the man and the artist. However, this may sometimes mean that what he states may not be totally factual. This is particularly the case in Stokowski's accounts of the events and circumstances of of his personal history. Also, you will in some cases find that these "facts" regarding his biography may also change over time among these Stokowski interviews. This includes specifics of his birth, of his family and ancestors, and of the events of his career. Therefore, these interviews may not be the best source of biographical information about Stokowski (biographies such as Oliver Daniel's Stokowski: A Counterpoint of View 1 are far more reliable). Another characteristic running through these interviews is that Stokowski's opinions and pronouncement seem (to me at least) sometimes to verge on the cliché, and without great depth ("...music can be all things to all people..." or "...music is the universal language of mankind...".) Stokowski's musical insight is deep and profound as can be experienced in his recordings, including those featured in this www.stokowski.org site. They seem a better index to Stokowski's manifest insight, rather than most of these interviews. Another thread is that, in speaking of the great composers and artists he knew, Stokowski often had somewhat uniform descriptions of them --- for example, that they were "simple" in their personal conduct and outlook, and in having modest habits. This seems to be praise and approval from Stokowski. However, describing Richard Strauss, for example as a "simple" man or Prokofiev as "simple like a child" would seem to stretch the concept, at least contrasted with other accounts of these two great composers by those that knew them well. Similarly, much different music was characterized in the same way, for example, Brahms' Symphony no 1 has "...a simple, childlike beauty". Again, Stokowski the musician and conductor seems a better reference than Stokowski the interviewee. In these interviews, Stokowski's expression in English is clear and communicative, but is given in what seems a mid-European accent, unique to him. The interviews clearly give an aural picture of the evolution of this accent over the decades where recording are available. Given that Stokowski was born and raised in England in an English-speaking household and lived substantially all of his long life in either England or the United States (Stokowski became a naturalized US citizen in 1914), this adoption of a new mid-European accent is striking. It has also irritated some people over the years, and has been used by his critics to dismiss Stokowski as a essentially a "showman" or "charlatan" 7,8. Stokowski's development of this method of speaking seems, from contemporary accounts, to have evolved principally between his time in Cincinnati and his arrival in Philadelphia. Some persons have speculated that this adaptation of speech was similar to adoption by American artists of foreign-sounding names at a time when a European musician would be accepted more readily than an American trained artist (for example, his first wife Olga Samaroff, born Lucy Mary Olga Agnes Hickenlooper). It would also accord with Stokowski's preference over the years to present a more exotic version of his biographical details, again exploited by his critics. In these interviews, beyond the Stokowski mid-European accent, somewhat irritating to some listeners may be Stokowski's affectation of being a non-English speaking European searching for the correct English expression in what is, for him, a foreign language. You will hear examples of his in these interviews. In this way, Stokowski would begin to use a foreign term, seemingly by accident, and then seem to catch himself and correct it to English. For example: "...in Deutsch...ahh [catching himself]...in Germany..."). Or, speaking of his personal investigations of Asian music, he would say that he went "...on the place...ahh...'sur place'...", so correcting a literal translation from the French expression with the original French. All part of the desired effect, it would seem. Similarly, he had the habit of referring to international cities by their foreign names ("Moskva" rather than Moscow, "Praha" instead of Prague), but with some surprising exceptions (such as "Vienna" rather than "Wein", or "Paris" in an English pronunciation, rather than "Par-ee" in a French pronunciation. Stokowski often used adaptations of non-English language terms, such as "Fagottist" for the bassoon musician and addressing the bassoonist as "Fagott" (the German term or "fagotto" in Italian, or possibly "fagotte", the French term for bassoon) in instructing the orchestra. Speaking of "orchestra", Stokowski usually pronounced orchestra as "or-KES-tra", with the accent on the second syllable for at least 60 years. However, there are some interesting exceptions. In Stokowski's 1927 analysis of the Brahms Symphony no 1 , included as one 78 RPM side in Victor album M-15, Stokowski says "OR-kes-tra", with the accent on the first syllable, as do most English speakers. He similarly used the conventional pronunciation in his 1927 analysis of the Dvorak Symphony no 9. Noticeable in these interviews is that Stokowski would frequently drop articles such as "the" or "a", particularly in public speaking. This mirrors a habit of certain non-English speaking speech patterns in dropping articles. Did Stokowski Speak Polish ? "...To me it was simply pure Stokowski. I feel that he was playing a role. For Philadelphia, the scenario had to be rewritten - it had to accentuate the Slav in him..." 4. Oliver Daniel's less censorious view of Stokowski in his speech and Stokowski's changing accounts of his history seems to me a correct view. It is consistent with Stokowski's desire to be at the same time private, mysterious, and striking. Examples were his occasional suggestion of having noble Polish ancestry, or in the 1930 US Census, where Stokowski indicated to have been born in France, and his age as 39 (actually 48). However, all this mystery and re-creation of his identity would seem (to me) perhaps part of a constant search for the new and novel. However, unfortunately, these recreations of his history have also aided those who, then and now, seek to characterize Stokowski as a 'charlatan' 7,8. Stokowski's quest for mystery and privacy were also a trait throughout his lifetime. His acquaintances were struck by the fact that generally, people would not know what Stokowski did the previous day, nor what he would do tomorrow. In this way, he seems to have kept his life compartmentalized. In the same way, Stokowski's second and third wives never met his mother, nor knew any details about her, even though she was still living during their marriages, and that Stokowski would occasionally visit his mother in her nursing home outside London. Should we seek to judge this quest for mystery and novelty ? Is it not better to concentrate on the music and the musical performances, the joy, and the insight he has given us through his sixty years of recording ? What is the importance of his re-creations of his personal details and of his history ? The music is the important part of this person I would regard as the greatest conductor of the twentieth century. However, these considerations also reinforce my opinion that the Stokowski interviews are not a particularly good way to appreciate or understand the achievements of the man or the musician, nor to gain any particular insight into his biography. So, sample these interviews "at your own risk". They come from my personal collection in some cases, and from publicly available sources in others. In 1972, the BBC made a broadcast billed as a tribute to the fiftieth anniversary of Stokowski's first London Symphony Orchestra concert of 1912. The tribute is a compilation of Stokowski interviews highlighting the divergences of Stokowski statements made during interviews, versus the information from various sources. It makes use of the discrepancies about his age and origin. The interview excerpts is contrasted from amusing musical excerpts from Fantasia (or, as Stokowski says during one of the interviews, "fan-ta-SI-a"). When talking about this he speaks about the "kino haus", using the German term, then correcting it to the "cinema house", again as a non-English speaker might do. This BBC tribute is in fact something of a send-up of Stokowski by the BBC, creating a montage that employs arch and indirect irony. This is interesting, but also "somewhat naughty", as some British might say. In October, 1962, Stokowski gave an interview to Seymour Siegel of radio station WNYC of New York describing his intentions regarding the formation of the new American Symphony Orchestra. Stokowski, somewhat in the manner of the All-American Youth Orchestra, auditioned and built an ensemble with a large percentage of youth, of women, and further including black and Asian musicians, in stark contrast to the established symphony orchestras. Also, ticket prices were kept low, and the programming continued Stokowski's genius for the interesting and the innovative. The creation of the new orchestra did not proceed without problems, and in the end Stokowski needed to subsidize its creation, and bankroll its continuing financial deficits over the next decade. He also conducted without fee. Stokowski built a first line orchestra, and his programming continuing to be innovative, in contrast to the conservatism that often characterized New York City's established ensembles. And Stokowski's string of great recordings continued with the American Symphony. Particularly remarkable was the first recording of the reconstructed score of Charles Ives Symphony no 4 recorded for Columbia on April 29 and 30, 1965, with conductors David Katz and José Serebrier assisting in the multi-layered score. 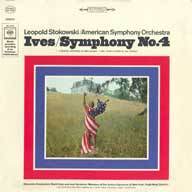 The Ives Symphony no 4 is surely a landmark of recording by any measure. Having collected all the commercial recordings of this work I have ever seen, listening to several concert performances and listening again and again to the symphony in order to grasp it, it still seems unmatched. Other conductors having decades more to digest and study this work have not equaled the integrity and inspiration of the Stokowski reading. Also, his evident understanding of the many musical quotes benefit not only from his understanding of the American music of Ives’s era, but also the of church hymn tradition and snatches of church music in the Ives composition. Stokowski's 1965 reading will not soon be surpassed. In 1968 in Philadelphia, Steve Cohen produced a series of programs about Leopold Stokowski, called "The Stokowski Story", which were broadcast on radio station WHYY-FM. Steve Cohen interviewed not only Leopold Stokowski, but also a number of members of the the Philadelphia Orchestra, the Houston Symphony, and other Orchestras and musicians. The Philadelphia Orchestra musicians went back as far as 1919 in their memories. There were interviews also with acquaintances who knew Stokowski from his earliest days in Philadelphia, and also in New York. The first excerpts from the Steve Cohen 'Stokowski Story' reproduce interviews with Stokowski recorded in New York City, probably in 1967. Stokowski provides a series of recollections of great composers whom he had worked with or had met. First of these was Serge Rachmaninoff with whom Stokowski made famous recordings of the Rachmaninoff Piano Concerto no 2, and the Rhapsody on a Theme of Paganini. Click below to listen to Stokowski's memories of Serge Rachmaninoff. Stravinsky was less close to Stravinsky, whom he also programmed in concerts. However, Stravinsky is said not to have favored the changes, cuts and orchestration adjustment which Stokowski made in performing Stravinsky throughout his career. As well as his interviews with Stokowski, Steve Cohen also conducted interviews with composers and musicians speaking about Stokowski. In about 1966, Steve Cohen interviewed the great American composer of Armenian heritage: Alan Hovhaness (1911-2000) about Stokowski's premiers of several Hovhaness works, including 'Mysterious Mountain' in Houston in 1955. Steve Cohen also interviewed Houston Symphony musicians William "Billy" Welch, Assistant Principal viola, and Ralph Liese Principal trombone regarding Stokowski's conducting and Stokowski's departure from Houston in 1960. Click here to listen to Stokowski speak about Toscanini methods. In this interview, Stokowski speaks of his travels in Asia, in which he says he always traveled alone. Apparently Evangeline Johnson Stokowski, his wife at the time of his one year travel in Asia 1927-1928 is perhaps forgotten --- at least omitted. Although the opinions of orchestra musicians were mixed as to Stokowski's decisions in changes to a composer's musical score, all of them seem to show a professional respect for his abilities. There is none of the tone of the "charlatan" criticism leveled by a few critics. Since orchestra musicians, particularly the virtuoso leaders interviewed here, tend to be a critical lot, this respect is notable. Note that Basil Rathbone died a few months after this 1967 telephone interview. In this interview, Stokowski speaks about his years with the Cincinnati Symphony Orchestra and his later change to the Philadelphia Orchestra. This interview is by Gordon Stafford from March, 1956. Stokowski On Conducting In December, 1969, Stokowski was interviewed by WGBH radio, Boston Public Radio on 'Creative Method: Leopold Stokowski on Conducting'. The interview, by Dr. Lyman Bryson, is somewhat superficial, and Dr. Bryson seems to lack insight into music-making of the symphony orchestra, or so it seems to me. His questions are therefore not always appropriate to gain a fruitful response from Stokowski. Notice that in this interview, Stokowski seems to have toned down the "Stokowski accent", and to have abandoned the mannerisms of a non-English speaking person searching for the correct word in the foreign language of English. The interview is somewhat interesting, and is presented in three parts of about 10 minutes each because of the file sizes. Click here to listen to Part 1 of "Stokowski on Conducting"
Click here to listen to Part 2 of "Stokowski on Conducting"
Click here to listen to Part 3 of "Stokowski on Conducting"
A number of Stokowski's rehearsals have been recording, demonstrating his efficiency in gaining what he wanted from musicians. One interesting Philadelphia rehearsal was recorded by a somewhat crude hand-held recording in July, 1965, and broadcast on the Philadelphia station WHYY-FM at that time. It is a piano rehearsal (without the Philadelphia Orchestra) with the Philadelphia Oratorio Choir of Prokofiev's cantata arranged from the 1938 film music for Alexander Nevsky. Until the end of the 1920s, we can see from Orchestra photographs that Stokowski's orchestral seating was the same as the traditional seating used by, for example, Toscanini. Then, beginning in the second half of the 1930s with the Philadelphia Orchestra, and continuing with many orchestras for the rest of his career, Stokowski experimented with reseating the orchestra to gain better sound. 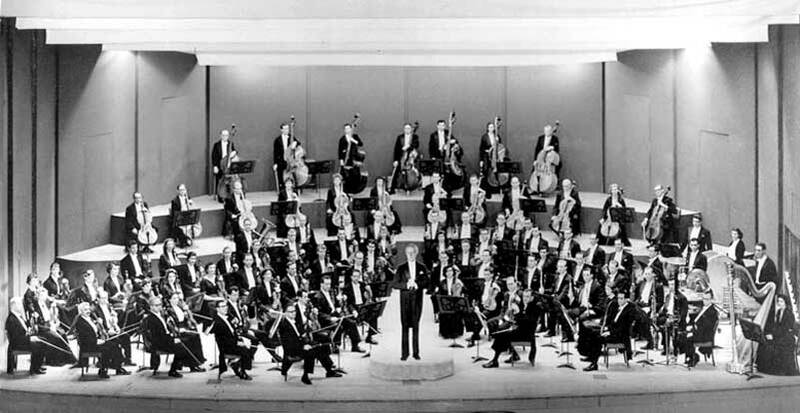 The picture below shows the changed orchestral seating of the Philadelphia Orchestra under Stokowski in 1939. This 1939 experiment he did not retain long, with the woodwinds in the first two full semicircular front rows, brass against the wall to Stokowski's left, the horns and percussion to Stokowski's right. The double basses were along the back wall, with the violins and violas in front of them. The one feature of this arrangement which he retained in future years was the string bass section along the back wall, or in some halls along the side wall for reinforcement. With his All American Youth Orchestra of 1940, Stokowski again had the basses against the back wall, with the celli in front of them. Also, the horns were to Stokowski's right with the percussion behind the horns. And again, the brass was against the wall to Stokowski's left, and the woodwinds were in a semi-circle in the first row in front of Stokowski, just as in 1939. However, the violins were now in the more traditional position to Stokowski's left, although in the second row, behind the woodwinds. Although Stokowski reseated the NBC Symphony Orchestra in 1943, perhaps he did not systematically reseat all the orchestras he conducted. In 1947, following Artur Rodzinski's abrupt departure from the New York Philharmonic, Stokowski was one of the conductors considered as Music Director. As can be seen in the 1947 rehearsal photograph below, the New York Philharmonic seems to be in the conventional seating, with first and second violins to Stokowski's left, and the percussion in the back. Other pictures from this rehearsal and of the concert in Carnegie Hall show the celli to Stokowski's right, and the basses to Stokowski's right in the back, in the traditional placement. On the other hand, Stokowski during this period was being particularly careful with the orchestra, and the Board of Directors of the New York Philharmonic, seeming to avoid anything that could be considered controversial or eccentric. He very much wanted to be selected as permanent Music Director of the Philharmonic; an objective which was not to be fulfilled (Dmitri Mitropoulos, who was co-conductor with Stokowski was selected instead). So perhaps this seating was also with the objective of "not making waves". Take a look at this 1947 New York Philharmonic rehearsal. By 1957, with the Houston Symphony Orchestra, as can be seen in the photograph below, Stokowski's seating had further evolved to a configuration which he seems to have used, but in various variations, for the next twenty years. Again, string basses were against the back wall on very high risers nearly 2 meters high, with the celli directly in front, also on high risers of perhaps 1 meter in height. First and second violins were seated on the stage floor to Stokowski's left, the traditional position. Violas were to Stokowski's immediate right, with the horns sitting behind the violas, center right. Woodwinds were to Stokowski's right, behind the violas, and the percussion were against the right wall, behind the woodwinds. As Stokowski states in the interview here, he was seeking, in part, better sound projection. It is clear from what he did that this reseating was not an eccentric whim, but a well-thought-out approach, with regular experimentation, to achieve a better orchestra sound. Stokowski also altered his approach to seating according to the characteristics of the hall, and even according the the sound characteristics of individual musicians. This interview is with Klaus George Roy, program annotator of the Cleveland Orchestra, and long-term friend of George Szell. This interview is from the intermission of a broadcast of Stokowski's last performance with the Cleveland Orchestra on May 13, 1971. 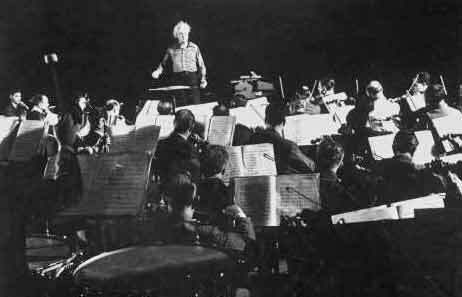 As he expresses it, Stokowski believed that the traditional orchestral seating, with the violins and celli in the front, the string basses in the right rear (as seen by the audience), the woodwinds in the center back, and perhaps left back, the percussion against the back wall did not necessarily provide the best transmission of the sound of each different instrument. He experimented with a number of different layouts over the years, and also varied such layouts according to the physical and acoustic layout of the hall in which the orchestra was performing. 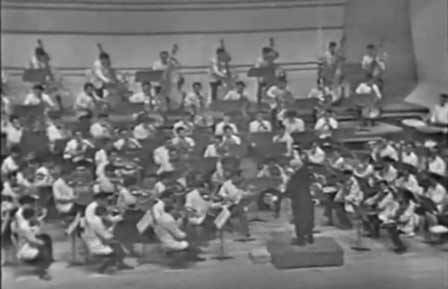 As can be seen in the Carnegie Hall 1965 concert with the American Symphony Orchestra, Stokowski maintains the double basses against the rear wall, with the woodwinds all at the right, close to the reinforcing right wall, with the percussion behind them. I heard the results of this reseating with different orchestras in Philadelphia, Chicago and New York, I can say the result was favorable as to clarity and sound. The differences were subtle, at least acoustically, but favorable. In stereo recordings, the sound difference I find to be less marked, since the multiple microphone placement and audio mixing of the more sophisticated stereophonic recording technology would bring out various instruments in ways determined more by microphone placement than by seating (but then Stokowski also insisted to determine microphone placement in recording sessions). In concert, however, I found the sound difference to be subtle, but effective. 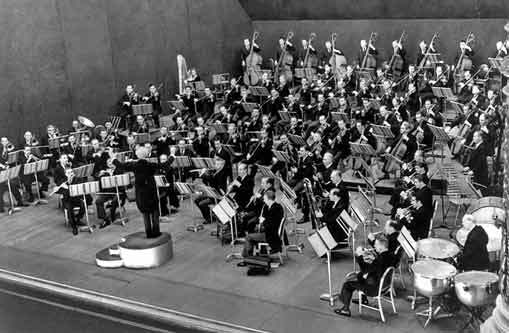 Visually, however, as can be seen in the photograph of the Philadelphia Orchestra in 1939, the result from changed seating is striking to anyone used to the traditional seating of the symphony orchestra. For this reason, some traditionalists resented Stokowski's efforts as being mere showmanship. It is said that Toscanini in particular resented the reseating of the NBC Symphony Orchestra. Time Magazine of said "...The minute Stokowski took over at NBC he began making changes in the broadcasting technique of Toscanini's orchestra. He altered the traditional seating arrangement. He insisted that the stringed instrumentalists bow out of step, to produce the lush, powerful Stokowski tone..." 3. However, these seatings, even for the same orchestra in the same hall would change from time to time as Stokowski sought the optimal result. For example, with the American Symphony Orchestra in New York, I never saw a seating such as this 1939 photograph. In Philadelphia, Chicago and New York in the 1960s, percussion was not in the front in the concerts I saw, but rather in the right back. Also, the brass was not in the front, but either to the right, further back, or in the center toward the rear. Horns and woodwinds were in front of the brass. Violas might be in front of the horns, to Stokowski's right. The string basses would either be along the back wall, so as to project their sound, or along the left wall, front to back, so that the natural sound projection of the instruments would be toward the audience. This reflection of the string bass sound from the back wall or the left side wall of the orchestra shell in many halls seems to have helped achieve the bass sonority that was such an impressive feature of the Stokowski sound, both in performance and in recordings. For example, in Symphony Hall Chicago, Stokowski would seat celli on his left, near the left wall, with first and second violins in front of the celli. Woodwinds and brass were on his right, with violas in front of them. Percussion was to the center-right toward the back. The basses were along the back (although the stage of Symphony Hall Chicago does not have a tall back wall such as with an orchestra shell, but rather a wall of perhaps 15 meters height, up to a small balcony of seats, with the organ pipes then behind these seats). It seems that in later years and with most orchestras, this configuration, described above for Chicago was Stokowski's preferred configuration, with the principal variation being whether the basses were along the back, or placed along the left wall, front of the stage to back of the stage. Also, the woodwind placement seemed to vary. Carnegie Hall in New York, venue for the American Symphony Orchestra concerts has a beautiful curving orchestra shell, with a full-height back wall, slightly curving into the left and right side walls. In this case, Stokowski placed the string bases along the back wall earlier in the 1960s, and then along the left side in the later 1960s. In addition to variations in the horizontal seating location of the musicians on the stage, Stokowski would also sometimes move them vertically. As can be heard in this Stokowski interview, some halls such as Severance Hall, Cleveland had greater flexibility of risers and Stokowski would change the instruments also vertically. He would place the basses on risers at the back or at the side, to allow better sound projection, with the celli perhaps also on risers in front of the basses, again at Stokowski's left. It is interesting that in the 1988 reconstruction of Symphony Hall Chicago, the stage was redesigned with a series of five, and in the back right, six different seating levels, facilitating the sound projection of the instruments. Symphony Hall Chicago did have risers for the Orchestra previously, but of a more modest scale of perhaps three levels. 2 page 6. Daniel, Oliver. op. cit. 3 Maestro's Furioso. Time Magazine. June 19, 1944. 4 page 118. Daniel, Oliver. op. cit. 5 page 233. Chasins, Abraham. Leopold Stokowski - A Profile. Hawthorn Books. New York. 1979. ISBN 0-8015-4480-7. 6 page 237. Chasins, Abraham. Leopold Stokowski - A Profile op. cit. 7 Horowitz, Joseph. Classical Music in America: A History of its Rise and Fall. W.W. Norton & Company, Inc. 2005. 8 Trotter, William R. pages 285-287. Priest of Music: The Life of Dimitri Mitropoulos . Hal Leonard Corporation. 2005.